Columbian Squires Circle 4481was chartered at St. Patrick on December 6, 1998 with 11 young men as charter members. Their names are shown below. The Squires organization is open to all young boys ages 10 to 18 and more than 22,000 participate in the program worldwide. 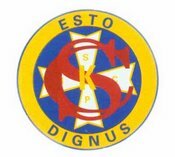 The Squires Circle at St. Patrick is one of 1,339 "circles" throughout the United States, Canada, Mexico, the Philippines, the Caribbean, and other places where Knights of Columbus councils are located. Every circle is sponsored by a Knights of Columbus council, and Knights serve as adult counselors to the group. Squires graduating from the program at age 18 are eligible for college and vocations scholarships offered by the Knights of Columbus Supreme Council office. They are urged to join the Knights to continue their commitment to Columbanism.